Cheese — that magic, fatty treat that illuminates our nachos and makes us feel fancy any time we toss a hunk of it in the vicinity of wine — falls into all three of these categories. In that light, the rise of processed cheese products like Velveeta, Cheez Whiz, Easy Cheese and Kraft Singles seems as inevitable as internet comment sections being co-opted by a-holes. The first commercially produced processed cheese was made in 1911 by Swiss cheesemen Fritz Stettler and Walter Gerber, who wanted to extend cheese’s shelf life when it was being shipped to warmer climates. So the duo heated shredded Emmentaler cheese and added sodium citrate, which, when it cooled, turned the cheese a smooth block o’ cheesy goodness. I haven’t been able to find a source that states whether Gerber and Stettler were wowed by the softness of their new cheese, but even if they weren’t, modern chefs are — Modernist Cuisine at Home still recommends adding sodium citrate to your macaroni and cheese for a cheese sauce that’s as velvety as your cat’s forehead. As with so many breakthroughs in making food act less like food, the next developments in cheese processing happened in the good old USA. And it started with one of our most recognizable names in “I guess that’s edible” products: Kraft. The chief object of the invention is to convert cheese of the Cheddar genus into such condition that it may be kept indefinitely without spoiling, under conditions which would ordinarily cause it to spoil, and to accomplish this result without substantially impairing the taste of the cheese. 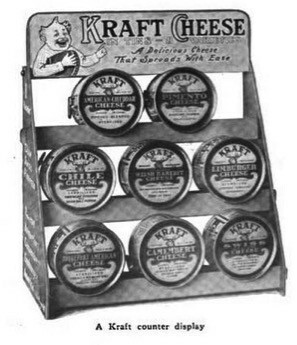 While Kraft had already established its canned-cheese dominance by the end of WWI, 1918 saw the birth of another iconic processed cheese. At Monroe Cheese in Monroe, NY, Swiss-born American cheesemaker Emil Frey started experimenting with ways to utilize the factory’s broken and misshapen wheels of cheese. Frey discovered that by reintroducing whey — a cheesemaking byproduct that might be most recognizable to the layperson from its shoutout in “Little Miss Muffet” — to broken cheese pieces, it created a cheese product that cooled to a solid block with a velvety consistency. Obviously, Frey named it Velveeta. Velveeta was successful enough that it became the spinoff to Monroe Cheese, and then was sold to Kraft in 1927 — although in this Smithsonian piece, Kraft notes that all they really took from Frey was the name, and that the company developed the Velveeta product themselves. Kraft’s next big processed cheese leap came in 1950, when they created a machine that shoved their the processed cheese through rollers, resulting in long, thin cheese sheets that could be cut into perfect individual slices — known at the time as Kraft Deluxe Process Slices. But the individually wrapped slices many of us remember from childhood weren’t even possible until 1956, when engineer Arnold Nawrocki was awarded a patent for a machine that easily wrapped them. 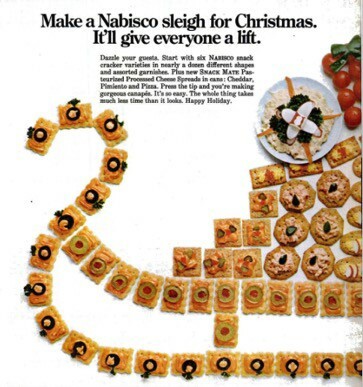 Kraft finally introduced the solo-slice versions in 1965. Hot on such a (literal) processed-cheese roll, Kraft started working on a processed cheese for the British market. (Because, after all, our brightest hope for the future is that we can all buy processed cheeses that are specifically targeted to our location and interests.) As it attempted to replicate the taste and consistency of the cheese in the classic drunk food Welsh rarebit (which you might remember from my article about early 1900s bachelors and chafing dishes), Cheez Whiz was born. These days, processed cheese has fallen on hard times, thanks to consumers turning away from convenience products in exchange for healthier food, a move that’s been championed by food writers like Mark Bittman. Long gone are the days of Velveeta and kin’s triumphant health claims; in March of 2015, the Academy of Nutrition and Dietetics gave Kraft a health-based seal of approval for Kraft Singles, a move that inspired so much outrage that they were forced to quickly rescind it. Kraft hasn’t exactly helped itself shake its processed cheeses’ bad rap. In 2003, the FDA made Kraft change the label of some products, including Kraft Singles and Velveeta, to “pasteurized process cheese food” because those products don’t even contain cheese or even real milk anymore, but milk protein concentrate. Cheez Whiz also no longer lists “cheese” as an actual ingredient. So, as we approach perhaps the most important processed-cheese holiday — Super Bowl Sunday — what is a processed-cheese lover to do when his cheese isn’t actually cheese? Well, you could make one of the queso recipes from 2014, the year everyone panicked about a possible Velveeta shortage. Or you could just eat that silky processed cheese, because by now, we’re all smart enough to know: No matter what the AMA or AND says, processed cheese is not a health food, or maybe even a food at all. But it can still taste damn good.